This week’s FeatureMe! 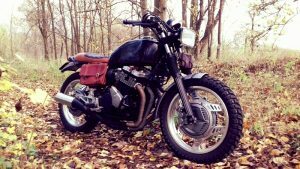 is brought to you by Colin and his ’82 Honda CBX550 transformation. Colin from Abingdon Oxfordshire had owned his motorcycle for over 20 years. However, he could never bring himself to part with his beloved bike. However, Colin’s love for his bike wasn’t the only thing on his mind. 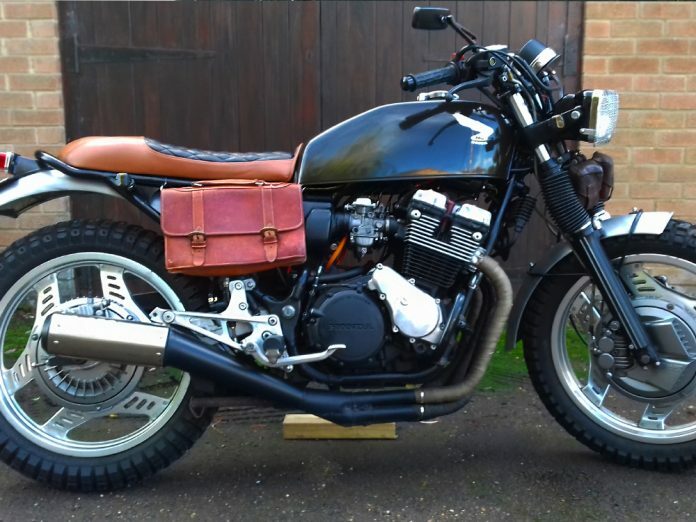 With his growing passion for the Brat bike scene, he saw great potential unlike no other in the old Honda in his shed. We often hear people asking ”what the heck does brat style mean?” Well, a Brat bike often refers to a nonrigid custom motorcycle with a long flat slab seat, or lowered solo seat; dirt-style handlebars (no clip-ons) Fenders bobbed, fairings and chrome removed. Having finally gathered the courage together, Colin decided to undergo his first transformation project. Armed with nothing more than his own knowledge, his skills and his garage, he slowly but surely started to develop a masterpiece. 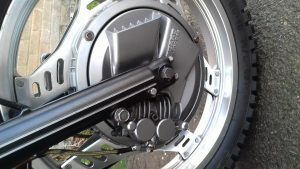 Colin said that his CBX front brakes acted as the initial inspiration for his old school Brat bike. 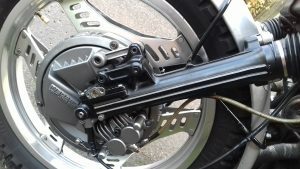 The front enclosed disc and callipers resemble TLS drum breaks, a feature popular on 60’s motorcycles. He initially spent a great deal of time researching online for ideas and inspiration. 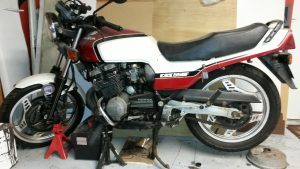 Eventually, he ended up scratching around at bike swap meets for random parts for his project as well as sourcing parts online. 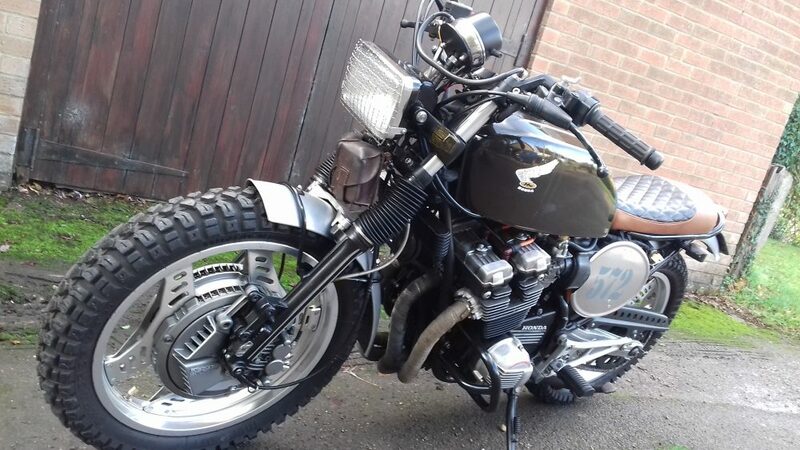 Shortly after, he swapped the CBX tank for a 400/4 version, which added slabsides and a flip cap into the mix. Colin then went on to create the bike’s seat base in 2mm aluminium and shaped the foam. After this was complete, he went on to have it professionally upholstered in leather in accordance with his own design. The wheels of the motorcycle are made up from original ComStar alloys with MEFO Sport Enduros in 110 & 130 section. Colin stated that he cleaned up old alloy guards with scotchbrite and handmade the period style brackets. Another old-school touch is the rear number plate. Using a scrambler rubberised lamp and number plate unit, Colin added scooter size raised digits for that retro look. The dash on the bike was swiftly removed. From here, it was then replaced with a single speedo and LED idiots lights fitted to the custom mount. The bars were detailed with stainless allen heads, as was the engine and any other generic bolt. The carbs were cleaned up, engine painted, fins detailed along with forks and brakes. Controversially, the exhaust downpipes were wrapped after having been coated with BBQ paint along with the rest of the Motad N-eta exhaust system. Colin was very keen to create a colour scheme that matched his cherished ’71 VW Beetle, so the tank was painted in Ford Rio brown too. Colin stated that he rides the bike frequently and stated that bike has been roadworthy and rideable for 3 years, even on the enduro tyres. He especially enjoys meeting up with other bikers and watching them try to pinpoint the original model. One thing is for certain though, the bike is absolutely stunning and certainly had our heads turning! The entire project took a total of 18 months which Colin juggled alongside the rebuilding of his ’71 Beetle. Colin estimated that the re-build cost around the £1,000 mark. The biggest expenses being the custom leather seat coming in at £250 and the tyres at £150. 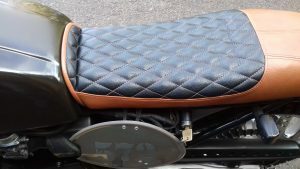 When we asked which part of his motorcycle he was most proud of, Colin stated it was a difficult decision to make between his custom seat design and his guard mounts which he made by hand. Tell us what do you think or the re-build. What do you like, and what would you change? Would you guess the model straight away? Drop a comment below and let us know. Don’t forget you must be signed into Facebook to comment! If you would like to submit your own motorcycle creation, you can head on over to our motorcycle submission form to tell your story. Next articleLIVE: Manchester Ring of Red 2018- Can you spot yourself?